So many optical illusions deal with the macabre. Skulls, for instance, are a common theme among many spooky optical illusions. There’s just something a little creepy about a bare human skull, isn’t there? I know we’ve had a lot of skull illusions on the site in the past, but they never seem to get old. This is one of those images that’s actually two images in one. Some people might notice one before the other. Which did you see first? 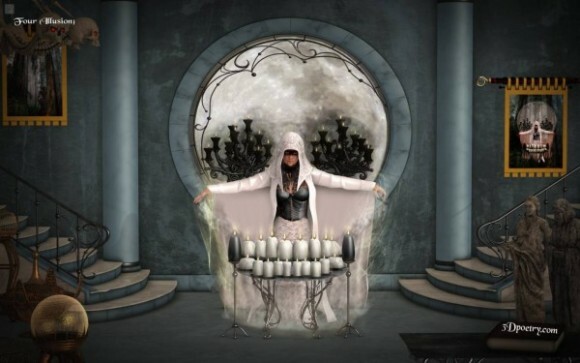 Did you see the woman in the hooded white cape at the alter with a round window and candles behind her? Or did all of the elements in this image create the human skull illusion for you right off the bat? If you liked this human skull illusion, you’ll definitely want to check out the rest of the skull illusions on the site! Next Trippy Crooked Illusion…With BONUS Afterimage!